Sarah J. Palmer – "Giving Birth to her First Born Babe"
giving birth to her first born babe. 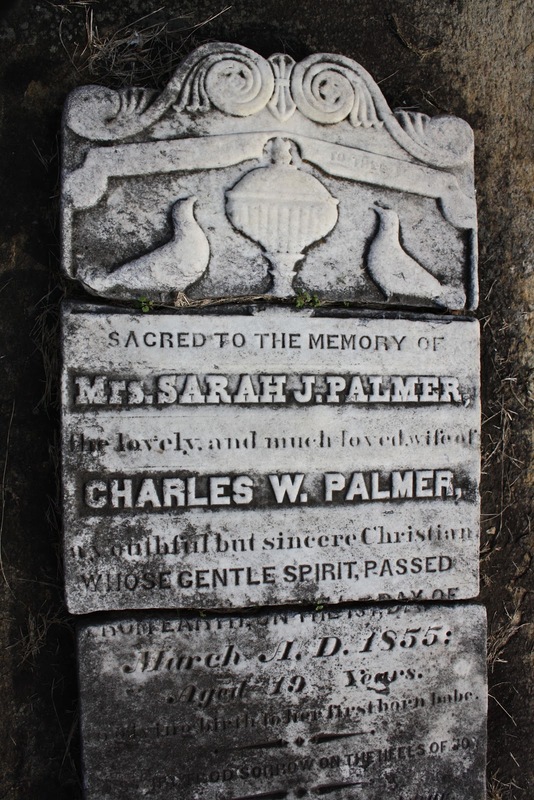 Sarah Palmer’s marble headstone (set in a granite ledger) rests on the grounds of Raleigh’s City Cemetery, split through the area which lists the day of her death, making it impossible to read with accuracy. The damage could have been due to weathering through age or the tornadoes that hit the cemetery in 2011. The headstone is flanked by volutes (the scrolls) and features two doves and an urn. I was unable to find specific information on Sarah or her husband Charles Palmer except for one source that suggests her maiden name was Williams and she and Charles married in 1853. If that information is correct, she was around 17 when she married and that marriage was extremely short. I don’t know if the baby lived or died nor do I know what happened to Charles after Sarah’s death. The list of burials for the cemetery has no information for Sarah, but lists birth and death dates for Charles that appear to really be those of his wife’s. Mistakes such as those are common, particularly when the information is being compiled by handwritten, unofficial transcriptions. In the 1850s the South was still very rural. Women in childbirth often lacked access to doctors and midwives. Even then, medicine wasn’t as advanced as it is today and women died from complications during and after labor that can now be prevented. As many as one out of every twenty-five southern women in 1850 died during labor. Unsanitary instruments and practices could result in hemorrhaging, seizures, and damage to the uterus-all of which could end a woman’s life during childbirth. Childbed fever also claimed the lives of many females during this time period. Also called puerperal fever, this infection usually presented itself three days after childbirth. Symptoms included extreme cold followed by a high fever, constipation, sweating, thirst, a headache, abdominal pain, a rising pulse, and a white tongue. As the disease progressed the symptoms became more severe and the patient could have diarrhea, nausea, vomiting, painful urination, and difficulty breathing. Some women even became manic or delirious. While it isn’t clear what exactly killed Sarah Palmer, the words on her tombstone give us cause to reflect on the hardships and fears faced by women during the time that she lived, particularly when giving birth. Neblett, Elizabeth Scott and Erika L. Murr. A Rebel Wife in Texas: The Diary and Letters of Elizabeth Scott Neblett, 1852-1864.